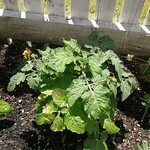 Sungold tomato. Transplanted from old QAPP plot after a couple months in the ground. Went through a shock period &amp; then started to fruit. I'm amazed that it's survived! Surely would've been bigger if not uprooted at this stage, but it's flourishing now.